Susan and I must have spent the last 2 years or so talking about our trip (mainly over glasses of wine or cups of coffee!). 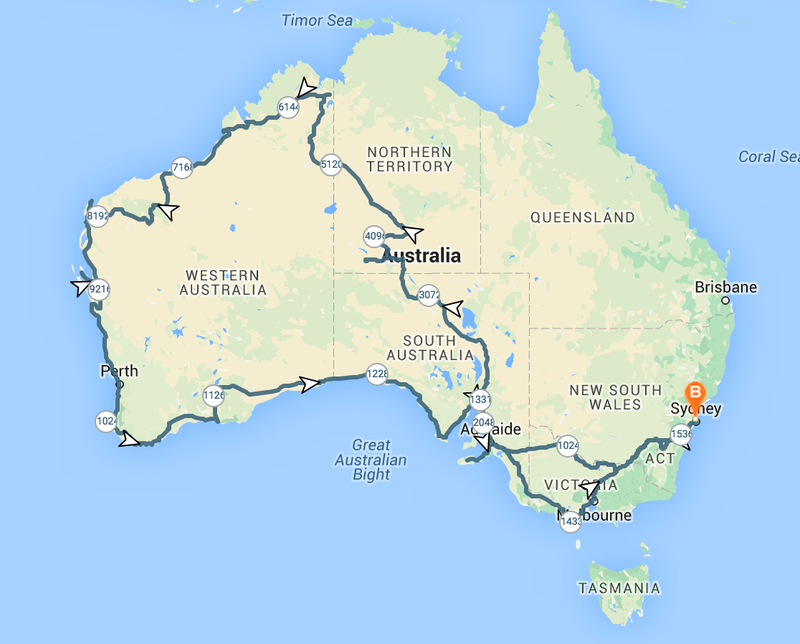 What started as dreaming about a lap around Australia, has now been fine tuned to 6 months travelling around half of it, encompassing our home states of South Australia and Western Australia. The main reasons for the reduction are the time and money needed to do the “big lap”, as we were really keen to hit the road as soon as possible after returning to Australia. So we thought we’d start with the places we’re familiar and grew up with – a return to our roots. So there’s been some fairly lengthy and intensive discussions over the last six months (more wine and coffee…), as well as a considerable amount of research (check out our boards on Pintrest! ), we now have the route pretty well planned out. The total distance as plotted on the map? 15,500kms! We main reason we decided to go anti-clockwise is the seasons. It gets really cold in the middle of Australia in winter, with Alice Springs easily recording 0 degrees at night! So we wanted to get there as early as we could before winter sets in. We also had the Gibb River Road to consider, as it’s best to tackle it during the dry season (which is May to October). So this way we catch it at the beginning of the dry. The only flaw it the plan is the weather in the south-west of Western Australia when we’ll be there in August, but I’m sure there’ll be lots of options other than camping! We’re making sure we have enough time in all of these places to really explore. If you have any suggestions and recommendations for “must see” places, then please do share them with us!